DJI has owned the American drone market for a while, and for a dang good reason. DJI makes fantastic drones with some of the most advanced features on the market. With a little practice anyone can fly one and pull off the kind of photos and videos you used to need a film crew and helicopter to get. A week ago GoPro, the action camera king, announced its own drone and stole a bit of DJI’s thunder. The DJI Mavic Pro is DJI taking its thunder back. 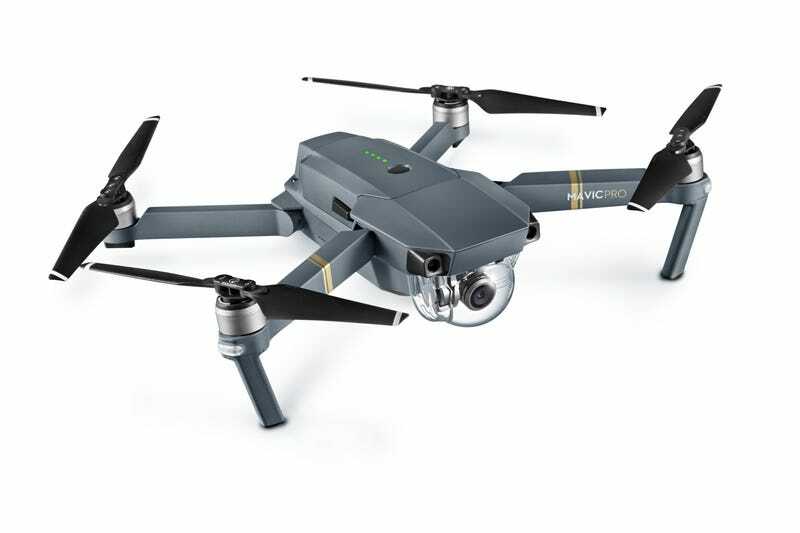 Like the previously announced GoPro Karma, the Mavic Pro is a full-featured aerial photography drone that can be folded up. But where the Karma fits in a backpack, the Mavic Pro is tiny enough to fit in a back pocket, and weighs just 1.65 pounds. Just because the Mavic Pro is tiny, doesn’t mean it’s crappy, like other small drones. The Mavic Pro has 27 minutes of battery life, a five-camera vision system, GPS, a 4K, 12-megapixel camera on a 3-axis gimbal. On hardware alone, it competes with most of the best consumer drones out there. The Mavic Pro also builds on the powerful brains that made products like DJI’s most recent Phantom 4 a hit. Using that five-camera vision system, it can spot obstacles and avoid them. (The obstacle avoidance only works at up to 22 mph.) Mavic Pro is capable of all kinds of smart autonomous flight tricks including several different follow modes. Whereas before the Phantom 4 could only follow you from behind, the Mavic Pro can lead you in front, follow you at a profile, and and even do a neat trick where it flies in circles around you while you move. <div style="position:relative; padding-bottom:56.25%; overflow:hidden;"><iframe src="
The Mavic Pro can go fast or slow depending on your needs. The drone has a super fast sport mode that sends the thing careening through the air at up to 40 mph. Tripod mode in which its maneuverability and speed is limited so that you can get super steady shots in doors. Maybe the most fun new trick is gesture control, which allows you to just wave at the drone to engage various modes—flailing your arms to set the Mavic Pro into follow mode or to capture a quick selfie. If using the Force to control a drone isn’t your bag, the Mavic Pro has a relatively small controller that can be folded up when not in use. It does require a smartphone to use, which is a little different from GoPro’s Karma—and it will add another $250 to the price tag, too. The Mavic Pro sans controller (you can use an app on your smartphone for basic control) costs just $750. That’s $50 less than the larger, camera-less Karma. The price, with controller, jumps up to $1000—which is in line with the Karma when a Hero 5 action camera in included. DJI also introduced a new heads-up display—called Goggles—that look a lot like every virtual reality headset ever made. DJI’s Goggles are all white and were designed to give first-person views of a drone as it’s flying. The Goggles are designed to deliver 85-degree video to two 1080p displays inside the headset. Perhaps the coolest feature is that two headsets can be synced to a single drone, so both people can see what a single drone captures in real-time. This makes it great for spectating or drone racing with friends. For now, there is no official price or availability date on DJI Goggles, but DJI is currently selling a bundle without the headset for $1,000. We’d expect it to be in the same ballpark if not a couple of hundred bucks more. Pre-sales for the DJI Mavic Pro start today and it ships October 15.